This week’s podcast is a Google hangout discussion about the Atheist and Christian differences in relation to human nature, the will, sentients, noetic ability, etc. (Anthropology). Christopher Maute a professing atheist joined in for the discussion. The discussion went into the nature of morality and which World View has the ability to deal with the actions of men. In this episode Jason discusses a recent interaction he had with an Arminian by the name of Andy who posted some disparaging comments about Calvinism on the logicalbelief.org blog. Jason challenged Andy to defend his comments on the Podcast. The ensuing email conversation is both educational and entertaining. The show is closed out with a brief discussion on Kent Hovind’s video response to an email written by Jason challenging his KJV-Onlyism position. This is the third episode where we examine the history and current day beliefs of the group called the Anabaptists. Kevin Wagler a former member of the Anabaptist group known as the Amish joins again as a guest on the show to discuss the topic. Jason the host of the show is also a former conservative Mennonite. In this episode Jason and Kevin discuss Menno Simons, the Schleitheim Confession, the Anabapist’s view of the Old and New Testaments, practice reform, the Sermon on the Mount, and Jakob Ammann. 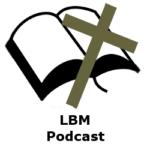 In this episode of the LBM Podcast Jason discusses the Five Solas of the Reformation. (Sola Fide – Faith Alone, Sola Scriptura – Scripture Alone, Solus Christus – Christ Alone, Sola Gratia – Grace Alone, Soli Deo Gloria – Glory to God Alone.) Jason goes into the history of the Five Solas and the Biblical foundation for each of these doctrines.